I made this for my daughters birthday. 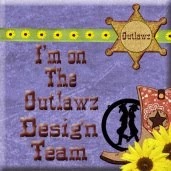 I used Heartfelt Creations products. I love working with these awesome products. 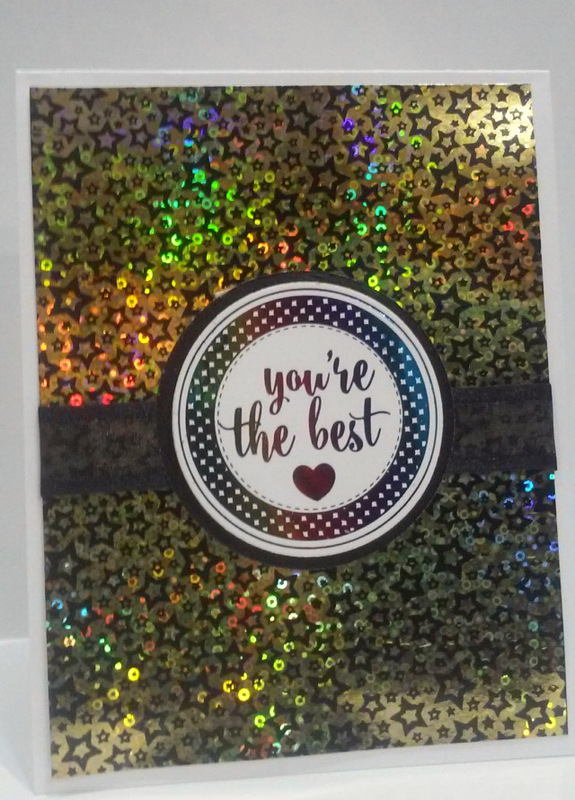 My finished card is 5X7. The background layer is a watercolored piece from my stash. I added some Tim Holtz Distress Inks, Abandoned Coral, Candy Apple Red, Scattered Straw and a gold watercolor from Kuretake on my mat. Then spritz with water and smoosh the watercolor card into it until happy (dry between coats). Cut 2 Eyelet Diamond dies out of mirror cardstock. Also cut the center of the Lacy Diamond dies 2 times from white glitter cardstock. Glue the white on top of the gold. Adhere the two diamonds diagonally on the background. 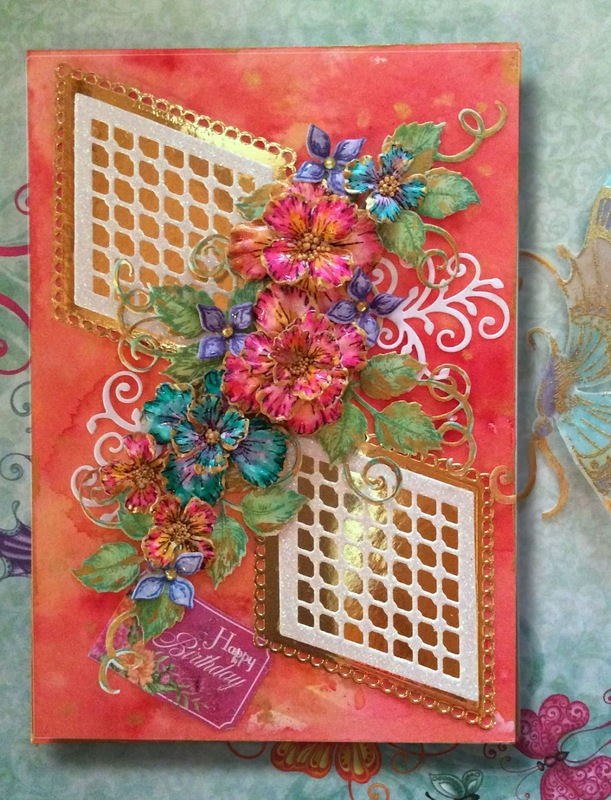 I used the leaf cluster 3 times from the Classic Rose Vines stamp and die for the flower base. I would have used the Leafy Accents with the 3D mold but couldn’t find my dies. I did include the links below. Stamp the vines with Memento Bamboo Leaves and sponge with a dauber Color Box Guacamole, over the leaves. Dry brush a little Pebeo Rich Gold paint randomly over the leaves then shape them using the Flower Shaping Essentials. I cut each branch in half and arranged diagonally across the card to use under the flowers. I was sure to have some curly Q’s in each corner. 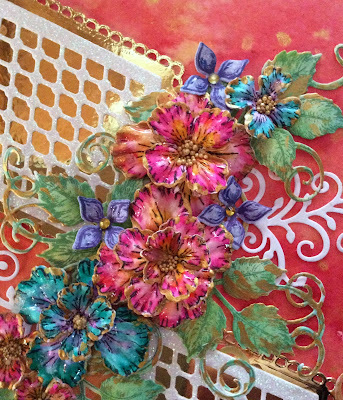 To finish the leaf layer, I added a couple flourishes from Ariana Lace dies. I tried using watercolor paper for my flowers, it is thick but worked great. 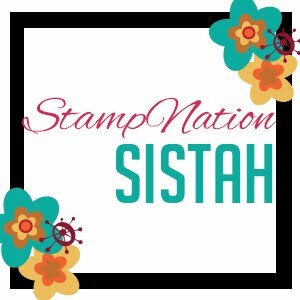 Stamp, color and cut 2 sets of Oakberry Lane Blossoms stamps and dies. Color the first set with Zig Markers, dark yellow in the center and a dark pink on the edges. I used a water brush to blend the 2 colors together. Repeat using purple and teal. Next layer the flowers in the 3D Blossoms Shaping mold colored side down and spritz lightly with water. I ran mine through a Spellbinders die cutting machine, no shim needed. This mold is awesome! If you want, you can color the petal edges. To keep with my gold theme I added bit of Pebeo Rich Gold paint (I applied with a micro brush). When the flowers are dry simply press in the centers using a shaping tool, front side up and assemble. Once assembled add a light coat of glue and add Glass Shards or glitter. When dry cover the petals with a glossy coat. Apply a big dollop of glue to flower centers and add gold Prills. Assemble and adhere arrangement on the leaves. I filled in with a few Lilac flowers and added a sentiment tag. Attach the entire panel to a 5X7 card base using double sided tape. It is easiest to apply the tape to the card base. Masculine, Dimensional & Easy to Mail, a triple hitter. This card was so fun to make, I used the Woodsy Wonderland Collection from Heartfelt Creations. The finished card is a standard A2 (4 1.4” X 5 1/5”). This is a tent card which gives you dimension, and folds flat for mailing. For the base card use a heavy weight cardstock (110-120 lbs.). Cut a piece 8 1/2” X 5 1/2” and place the long side at the top of a scoreboard. Score at 1 3/4” (this will be the top flap you see in the front). Then score at 6”, 7” and 8”. For the top flap cut a piece of blue sky from the Woodsy Wonderland Paper Collection 1 3/4” X 5 1/2” and adhere to the top flap. To cut the decorative edge use a Fleur Border Basics Die. Place the die over the flap bottom edge and run through a die cutter. Cut your decorative paper for the card center 5 1/2” X 4 1/4”. I cut a section with the house. Adhere this to the card between the first and second folds. With the paper side up put double sided tape on the backside of the flap and on the 1/2” flap. Cut a piece of acetate that is 5 1/2” X 4” and place over the background and line up with the 1 3/4” fold line . Fold the decorative edge to the front toward the center panel and crease well. Fold the 6” score line toward the center panel, down at 7” and up again at the 1/2” (like a fan fold). This forms the tent. Crease all score lines well. Place the acetate a tad below the flap fold over the image. Remove the tape liner from the flap and press down on the acetate. Remove the tape liner from the 1/2” flap. Hold the bottom flat to position the acetate under the 1/2” flap and press the flap down. 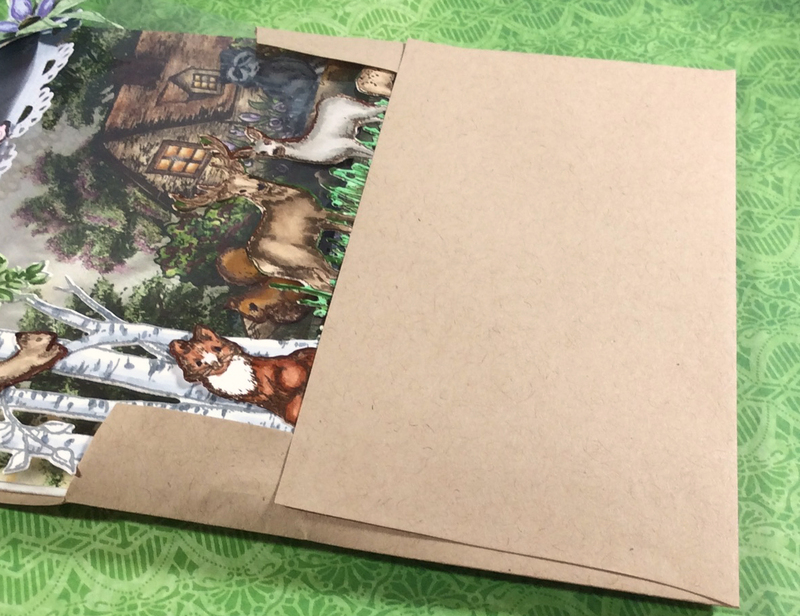 The card will now stand on it’s own and fold flat for an envelope. 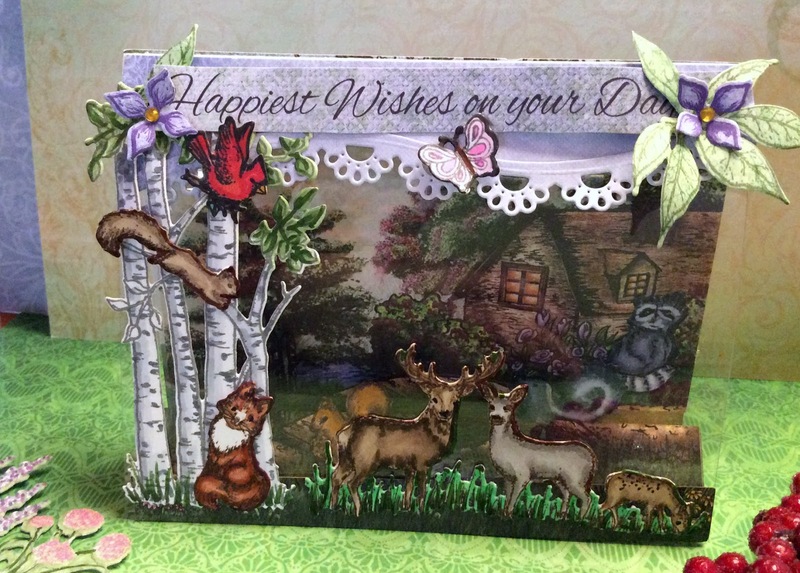 I stamped, colored with Copic markers and cut the critters and tree from the Woodsy Wonderland collection. The tree and deer get glued on the acetate. The bird, squirrel and fox are added to the tree. The raccoon is glued to the background layer, the skunk is glued to back of the middle (mountain) fold, the squirrel is glued to the front. This really gives a lot of dimension! Cut a sentiment from the paper. Glue leaves to the corners of the flap (leave the inside edges free) and 2 little lilac flowers. Tuck the sentiment in and adhere. Add a tiny butterfly from the Woodsy Wonderland collection. 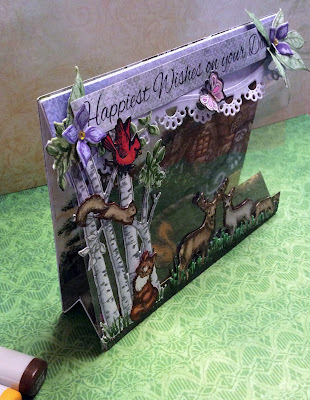 For a finishing touch glue a piece of the decorative paper on the card back and then add an open panel for writing. 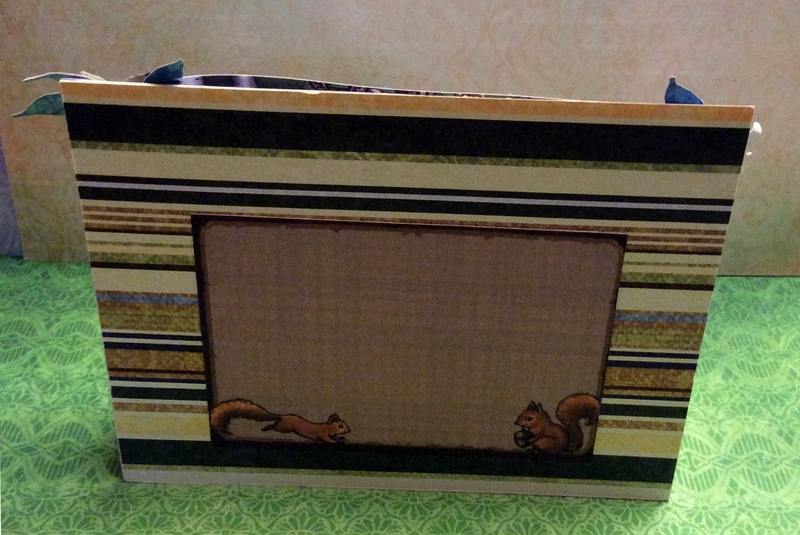 I used the stripe paper and tan rectangle with squirrels. 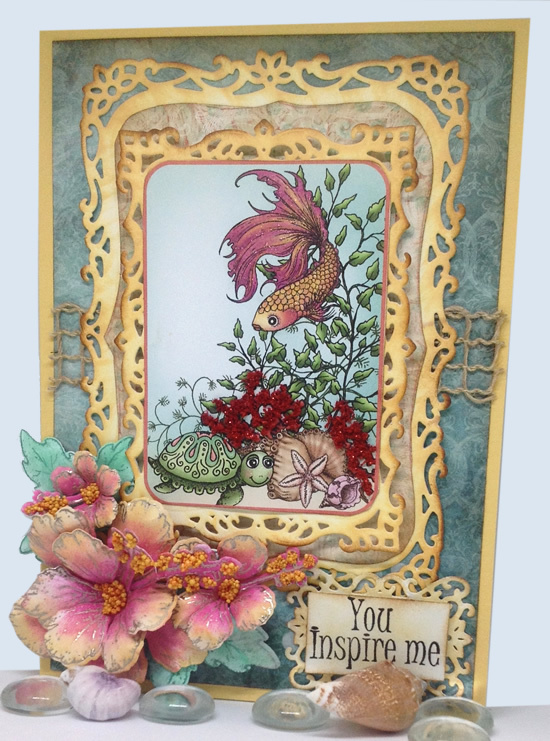 I made a card and shaped hibiscus flowers using the Heartfelt Creations Under The Sea Collection.I wanted to show how easy it can be to create a dimensional card using this gorgeous ollection. Stamp the Tropical Hibiscus Cling Stamp Set HCPC-3736 use Versamark embossing ink. Add Ranger Platinum embossing powder and melt with a heat gun tool. I used a Clorox stylus to color the leaves with Cracked Pistachio Distress ink (any sponge would work). I use the side of the stylus to add the veining. Color the flowers with Picked Raspberry in the center and Scattered Straw on the tips. Shape the flowers as Emma Lou shows here: https://www.youtube.com/watch?v=84Re1-gaq1o&t=394s Once done add Prills to stain tips and flower centers. used Go Man Go. Cut the 2 larger Spellbinders Decorative Labels dies on white cardstick the color the edges with a brown ink. I used Vintage Photo Distress ink. cut a background layer from Designer paper (I used a teal from All Geared up) and glue to the card base. Glue on the burlap ribbon a little higher then center. Glue on the largest die the add more pattern paper the size and shape of the die interior (Trace the inside of the die on the pattern paper and cut). Adhere medium die frame with pop dots. From the Under The Sea Paper Collection select a small scene that will fit inside your smallest frame. Enhance the scene by adding Wink Of Stella to the fish. Add glue the coral and sprinkle on red Flowersoft (or something with texture like Prills). I diet the turtle and shells from the Under The Sea Paper Collection. Cover the turtle and shells with Glossy Accents. Cut the smallest die from the Decorative Labels and add a sentiment. Place the flowers in the lower left corner. Dries As Clear glue works great. 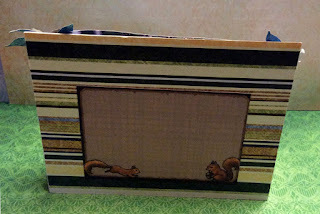 I made this for the Gina K Designs January challenge. Use sentiment only, no images. This is the negative if some Gina K Foil I added to a toner sheet. I also foiled the sentiment which is a Foilmate. It's so much more beautiful in person. This is for a man.